When a youth of 17, he was chief clerk to an eminent merchant at St. Eustatia, who being absent, the business of the compting room, of course, devolved on young Hamilton. He had handed to him a letter, directed to his master, which, supposing it related to mercantile concerns, he opened; but his surprize was great when he found that it contained a challenge to his master, whose proxy he was. The young hero answered the challenge in the name of his master, and the time and place was mentioned in the reply. Hamilton appeared to the antagonist of his master on the field; and, to use his own words, ‘did his business in his absence,’ and would not agree to any compromise, except on the express condition that the challenger should acknowledge, in writing, that he had received suitable satisfaction from Mr. ——, that he was a gentleman of honor, &c.; and further, that he (Hamilton) should never be known in the business—which terms the challenger was obliged to accede to, or fight young Hamilton; he chose the former, and the parties separated. In a few months, however, it came to his master’s ear, who was so struck with the magnanimity of such conduct, that he gave him liberty to come to the Continent, choose what profession he pleased, and draw on him to any amount! Perhaps to this anecdote, we are indebted for the services and abilities of a man who has not his superiour as a solider, a financier, and a statesman. * I would like to thank @medg2001 for bringing this anecdote to my attention. ** This anecdote appears in The Papers of Alexander Hamilton 26:236n, but that volume cites the Gazette of the United States & Daily Advertiser of June 28, 1800. The above is an earlier source and apparently the original printing of the story. This anecdote was subsequently republished in dozens of newspapers across the country. Needless to say, this anecdote is clearly wrong in many particulars. Most notably, it states that Hamilton had been the “chief clerk to an eminent merchant at St. Eustatia.” Hamilton had, of course, been the chief clerk to Nicholas Cruger on St. Croix, not to a merchant on St. Eustatius. However, Hamilton had lived on St. Eustatius as a youngster and had been sent on a “commercial expedition” or “errand” to St. Eustatius in 1772, so perhaps one of these was the cause of placing Hamilton on the wrong island at the wrong time. Additionally, according to this anecdote, as a result of this event Hamilton’s employer decided to send him to the mainland and paid his way. But we know that Hamilton’s trip to the mainland for an education was paid for by Ann Lytton Venton, Hamilton’s cousin. The anecdote itself also makes little sense. The whole idea of a young subordinate employee convincing someone who had challenged his employer to forego a duel, give up his grievance, and acknowledge having “received suitable satisfaction” without the other party’s knowledge or approval is hardly believable. Moreover, one should always question an uncorroborated story coming from an anonymous source, especially when appearing years after the fact far away from the location where it took place. This “correspondent” claimed to have quoted Hamilton’s “own words,” which certainly makes it sound like Alexander Hamilton was the original source of this story, but Hamilton apparently never told his wife or children about this or he discountenanced it because his son John C. Hamilton surely would have included such an interesting story in his biographies about his father if they had heard this tale and believed it to be true. This story is especially noteworthy and perhaps more credible because, as @medg2001 pointed out to me, it appeared years before Hamilton’s name and character became associated with dueling. Yes, this was an attempt to boost Hamilton’s reputation against the barbs of John Adams and his cohorts and thus must be taken with a grain of salt, but it was not an attempt to make Hamilton look better with regard to duels since that was not yet an issue. Assuming the story is not entirely fiction, there must be some sliver of truth to this “anecdote.” Perhaps Nicholas Cruger’s “supposed duel” of 1767 (see parts 1 and 2 of that story) is the basis for this anecdote about Hamilton’s near duel. Admittedly, the two stories are widely divergent, but Nicholas Cruger’s “supposed duel” is the only known case in which he was involved in a “duel” around this time. The only noteworthy similarity between the two stories is that in neither case does the duel actually take place. That said, the two stories are so different that it is hard to believe that the one came out of the other. 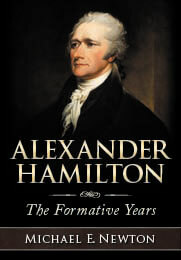 One could also argue that this anecdote points to Hamilton being born in 1755 rather than 1757, as most believe and as I concluded in Alexander Hamilton: The Formative Years, because the anecdote states that Hamilton was “a youth of 17” when this event took place, which Hamilton would have been if this undated event occurred just before Hamilton left the West Indies and he had been born in 1755. However, given the doubts regarding the veracity of this story and the many errors it contains even if it is partly true, I wouldn’t give this anecdote any weight in helping determine Hamilton’s year of birth. For the reasons stated above, I am forced to believe that this anecdote probably was a fictional tale, perhaps based very loosely on hearsay accounts of Nicholas Cruger’s “supposed duel” of 1767. That said, it is possible that the story is true, or more likely that the gist of it is true even though many of the particulars are not. © Posted on June 4, 2018, by Michael E. Newton. Please cite this blog post when writing about these new discoveries.